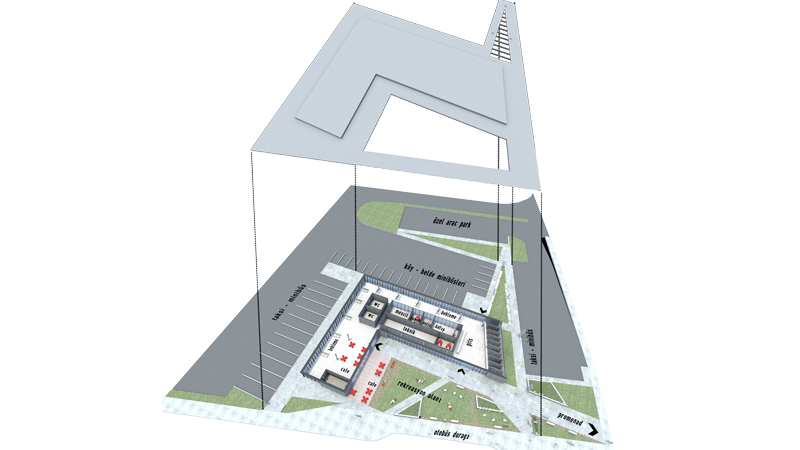 Recommended Lüleburgaz Bus Terminal is designed based on two pedestrian axis parallel and perpendicular to Murat Hudevandigar Street. Continuity of pedestrian and vehicle traffic are provided by separating them completely. 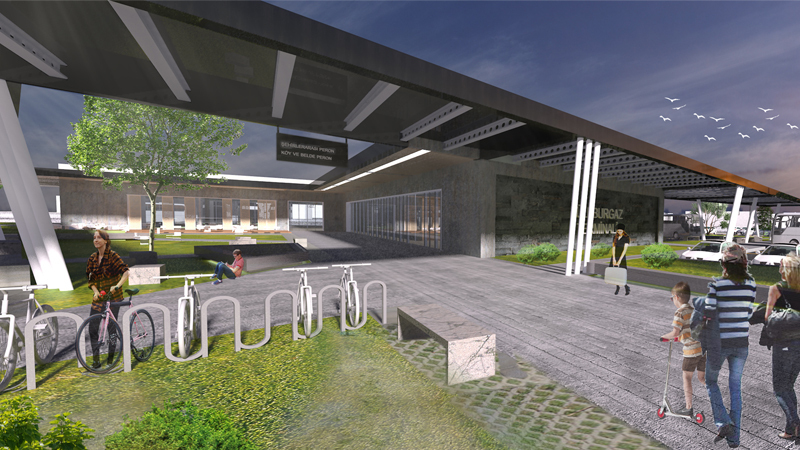 Due to proximity of the terminal to the city center, an urban recreation area is proposed to the south of the terminal structure. 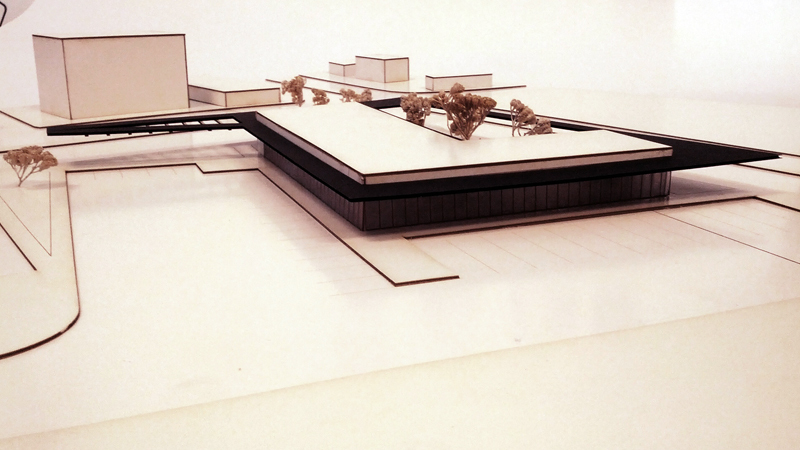 Considering terminal building as a prestigious building of the city, it welcomes pedestrians through a recreation area. Distance is kept minumum between bus perons and waiting spaces with an L shape. 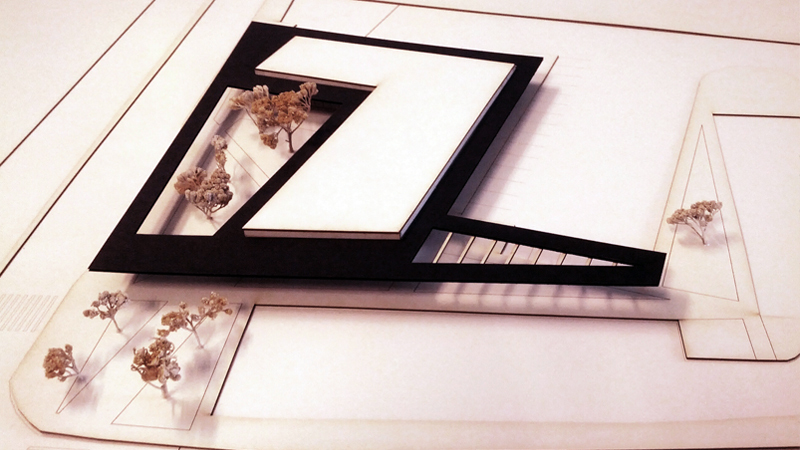 Flexible structure allows transformation into an another function in the future. 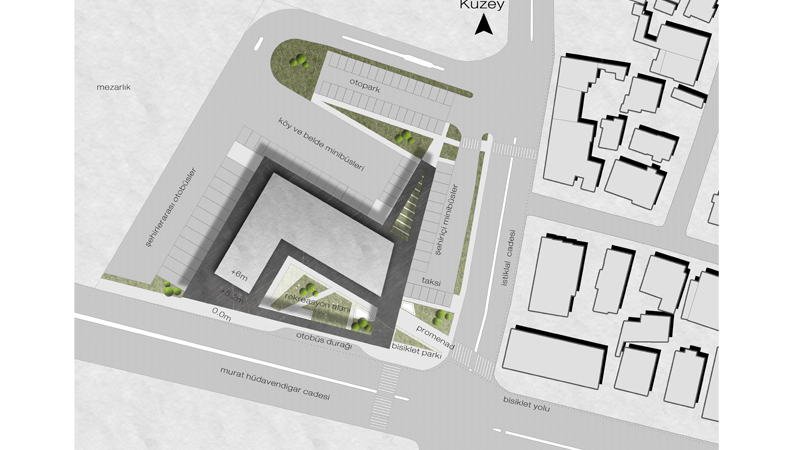 The project site of the Lüleburgaz Bus Terminal is located close to the city center . 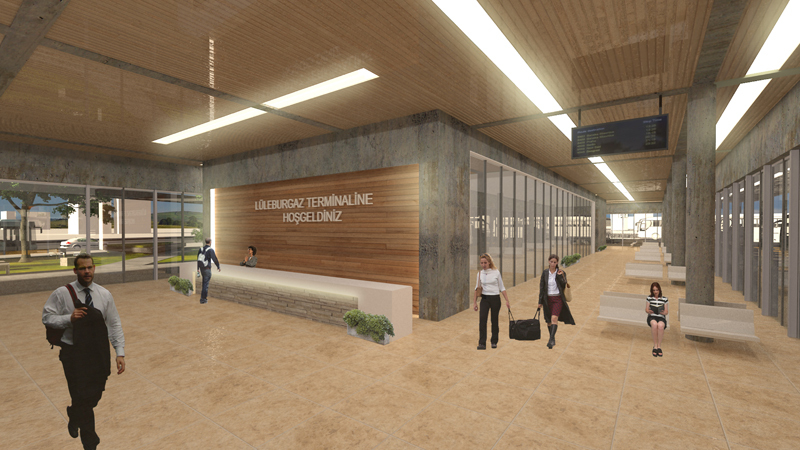 It is aimed to design a pedestrian access on the front of the road, considering the increasing pedestrian intensity that terminal will serve villages and other cities in the future. For this purpose pedestrian traffic and vehicle traffic are separated. It was resolved in the north of the terminal building. Meanwhile the noise and traffic created by buses and minibuses are avoided. An urban space is created in this area. 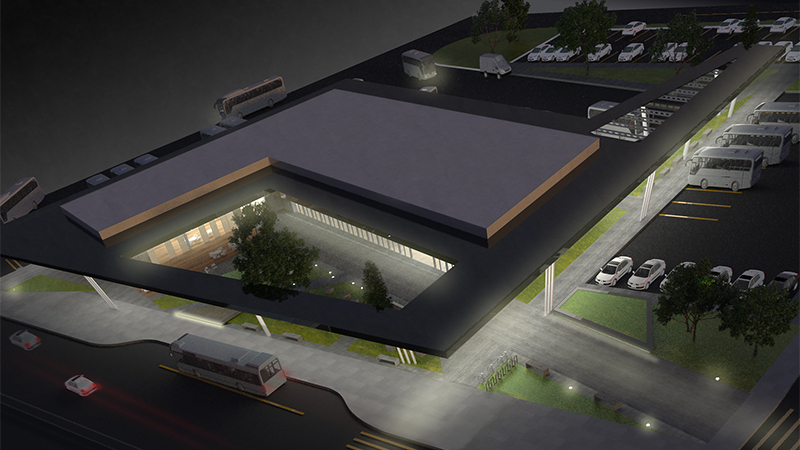 The Lüleburgaz Bus Terminal was arranged to use the existing entrances in order to decrease vehicle traffic and environmental regulation costs. 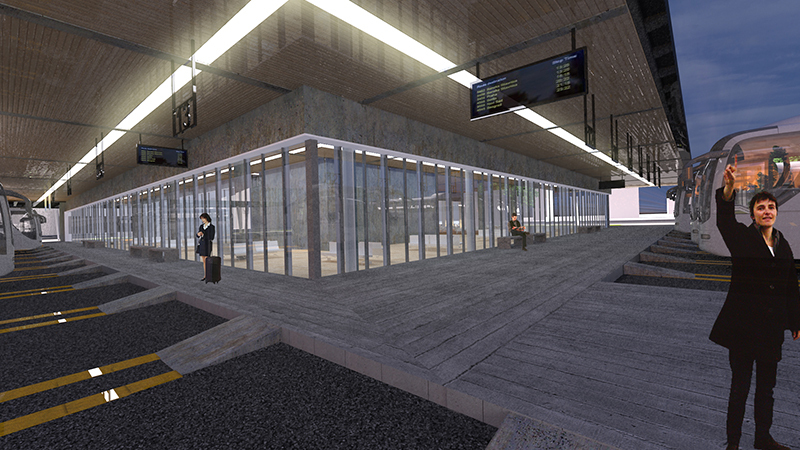 The visitor entrance is given from the neighboring 7mt road, while the entrance of the bus is from the south entrance of the terminal. Due to the fact that the Lüleburgaz Bus Terminal is 600 meters away from the city center and the topography is suitable, bicycle parks and rental areas are placed around the building . It is speculated that day-trips from districts and borders will provide pedestrians and bicycles to increase traffic in the city. Because of the narrow space, public transport (city buses and taxis) are located in front of the terminal, and private car parking is located in the north.